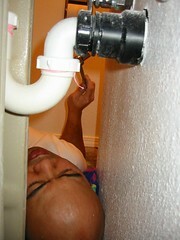 That's the P-trap and waste pipe for the sink, if you're curious. The little pink bits of tape's the teflon tape. It didn't work. Had some minor leakage so I had to redo.